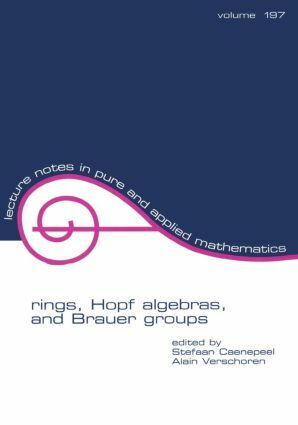 "Based on papers presented at a recent international conference on algebra and algebraic geometry held jointly in Antwerp and Brussels, Belgium. Presents both survey and research articles featuring new results from the intersection of algebra and geometry. " Sur les invariants des algebres de Weyl et de leurs corps de fractions; a Picard-Brauer five term exact sequence for braided categories; topological methods in algebra; an introduction to effective calculus in quantum groups; Kummer theory for monogenic Larson orders; smash (co)products from adjunctions; module-theoretical properties of good curve singularities; Morita-Takeuchi equivalance, cohomology of coalgebras and Azumaya coalgebras; decomposition of locally finite modules; existence of covers over fixed rings; on the application of the factorization ideals associated to a finite free resolution; division theorem over the Dwork-Monsky-Washnitzer completion of polynomial rings and Weyl algebras; maximal subfields in the quotient division ring of an enveloping algebra; a Maschke-type theorem for quasi-Hopf algebras; when are all the finitely generated modules embeddable in free modules? ; skew-primitive elements of quantum groups and braided Lie algebras; involutive invariants of a Krull domain and Amitsur cohomology; the spectrum of Abelian categories and reconstruction of schemes; face algebras are xR-bialgebras; intersection dimension and canonical modules; Brauer groups of actions; an alternative approach to involutive Brauer groups; a new dimension for schematic algebras.